We are really pleased that Jodie has recently returned to Shine Dental Care Mansfield following her Maternity leave and having a beautiful baby daughter. Jodie has worked at the practice as a dental nurse since our very first day and here is a photo from the Shine archives of her and our dentist, David Heath taken. when we opened back in 2010. We thought that we would have a little fun and see just what has changed in the last 8 years. 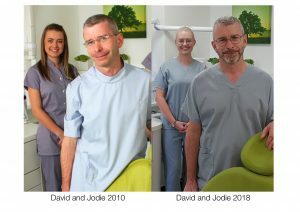 Our team has grown since this time and we have continued to invest in new technology to continue to offer our patients a broad range of dental treatments including general dentistry, cosmetic dentistry, teeth whitening, white fillings, root canal treatments, dental veneers, Invisalign teeth straightening with clear braces, Cerec same day crowns and dental implants.